Kate had a rectangular tin measuring 6 in by 7 in by 8 in and was full of apple juice. She poured some of her apple juice into Lily’s rectangular container to fill it up. 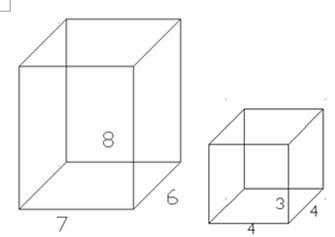 Lily’s rectangular container had a square base of sides 4 inches and the height was 3 inches. At the end, how much apple juice was left in Kate’s tin?